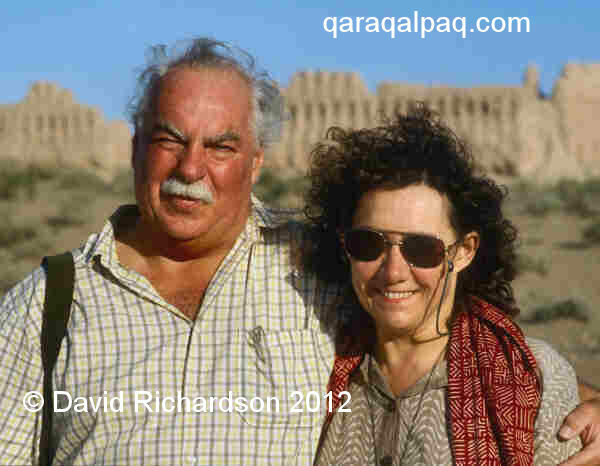 We are David and Sue Richardson, independent UK-based researchers specializing in Khorezm, the isolated region watered by the lower reaches of the Amu Darya lying just to the south of the Aral Sea. Khorezm, or Chorasmia as it is sometimes called in a historical context, has had a fascinating history, the earliest Khorezmian civilization dating back to the first half of the first millennium BC. By 1200 AD the Shah of Khorezm ruled over the most powerful state in western Eurasia, controlling a region encompassing present-day Uzbekistan, Turkmenistan, northern Iran, Azerbaijan, southern Iraq, and northern Afghanistan. A relatively minor dispute involving a merchant camel caravan escalated into a major dispute between Khorezm and Mongolia and Chinggis Khan's invasion of Central Asia and Eastern Europe. Today the lower Amu Darya is home to several different peoples of Turkic origin, one of the most interesting being the Qaraqalpaqs. Much of the history of Khorezm and knowledge about its indigenous peoples, especially the Qaraqalpaqs, remains relatively unknown in the West. Yet for the past seventy years or more the region has been at the centre of intense archaeological exploration and study by Russian and other Soviet researchers. 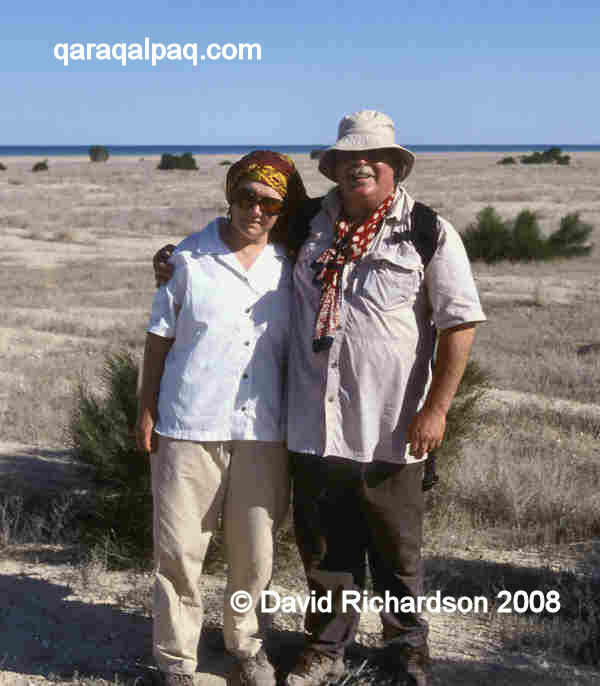 In America and Europe there remains widespread ignorance concerning the origins and culture of the Qaraqalpaqs. Qaraqalpaq artefacts, especially Qaraqalpaq rugs and weavings, are frequently misattributed, while unusual examples of material culture from other Turkic tribes are often mistakenly classified as Qaraqalpaq. 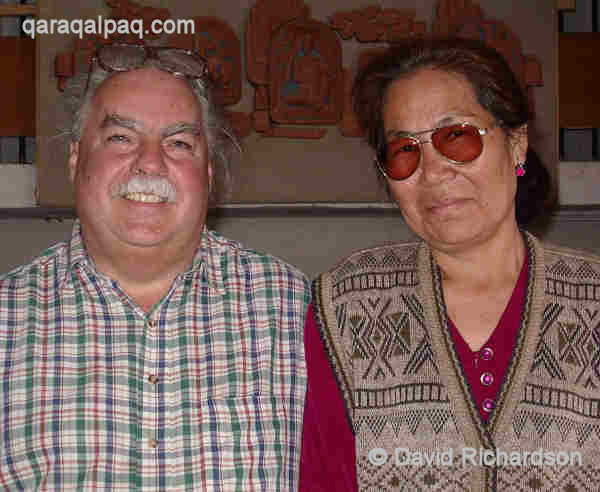 Our passion for this region and its people began with our first visit there in 1996 under the wing of the writer Sheila Paine and has grown with each return visit. As avid students of handwoven textiles from around the world we were initially fascinated by the material culture of the Qaraqalpaqs and became frustrated to find that there was very little information available in the published literature. We began by studying the textiles and quickly realized that our understanding of them would be greatly enhanced by an understanding of the complete history of the Khorezm oasis and the wider Aral region. Although we are not historians or ethnographers by training, we both have logical and inquisitive minds. David was trained as a scientist and holds a doctorate in quantum physics from Cambridge University. He spent his career as a senior manager in the British chemical, pharmaceutical and scientific equipment industries. Sue is an English literature graduate with a love of the English language. She spent her career in personnel management and training in the British retail industry. We have both travelled extensively throughout the developed and the developing world. 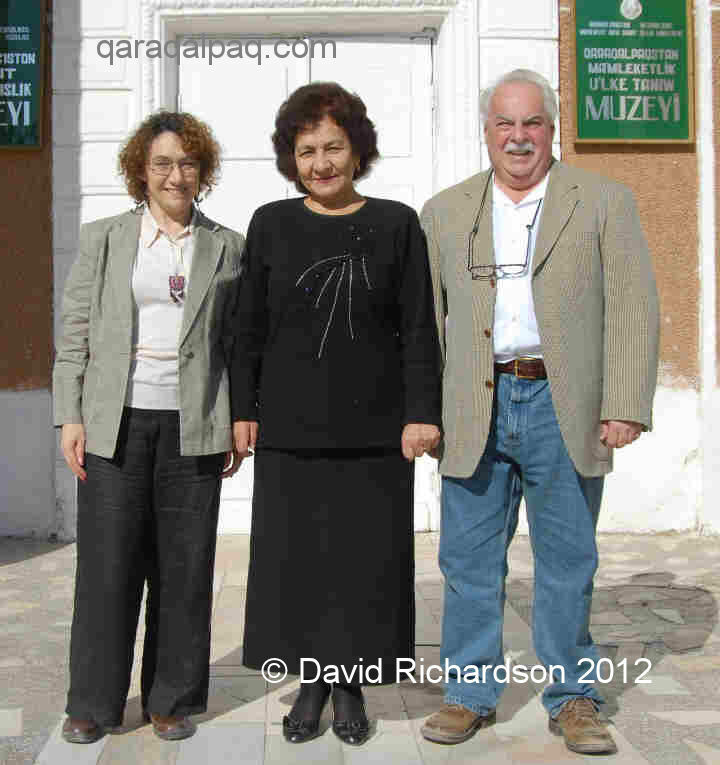 Since retirement, the study of Qaraqalpaqstan and the Khorezm oasis has become our full-time occupation. It is of course very easy to become armchair researchers and to philosophize about a subject without a thorough knowledge of the area of study based on actual visits to the region concerned and discussions with local specialists. The internet is packed with inaccurate and misleading information about the Qaraqalpaqs and their homeland. We have consequently strived to travel extensively throughout Uzbekistan and Turkmenistan, especially within the Khorezm oasis and the three deltas of the lower Amu Darya, visiting every major town and village and numerous collective farms and small awıls. 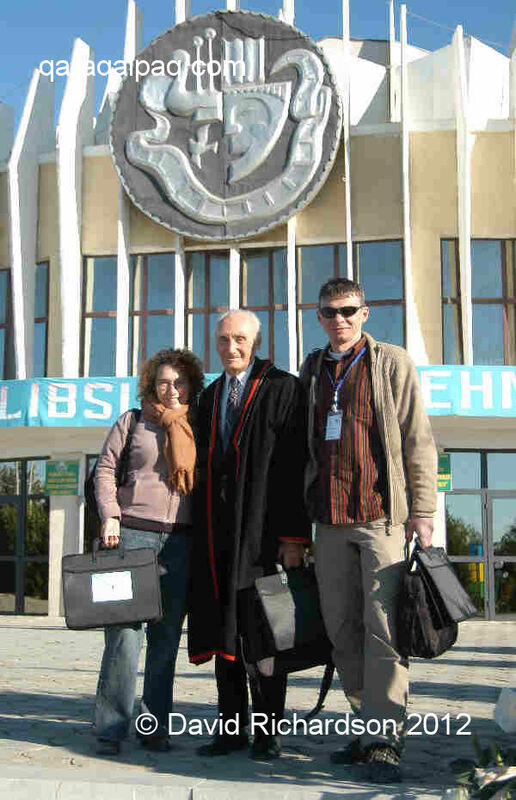 Sue, Vadim and Maxim at the Palace of Culture, Bostan, Qaraqalpaqstan, October 2007. Attending the "Aral Sea at the Crossroads of Civilizations" conference organized by the Academy of Sciences, No'kis. We have travelled with archaeologists to explore the many ancient ruins hidden in the vast wilderness surrounding the Khorezm oasis. We have crossed the dried-up bed of the Aral Sea from gas rig to gas rig and camped on its shrinking shoreline. We have ascended and traversed the baking U'stırt plateau and watched Golden Eagles hunt along the escarpment of the tchink. We have sailed along the Amu Darya. 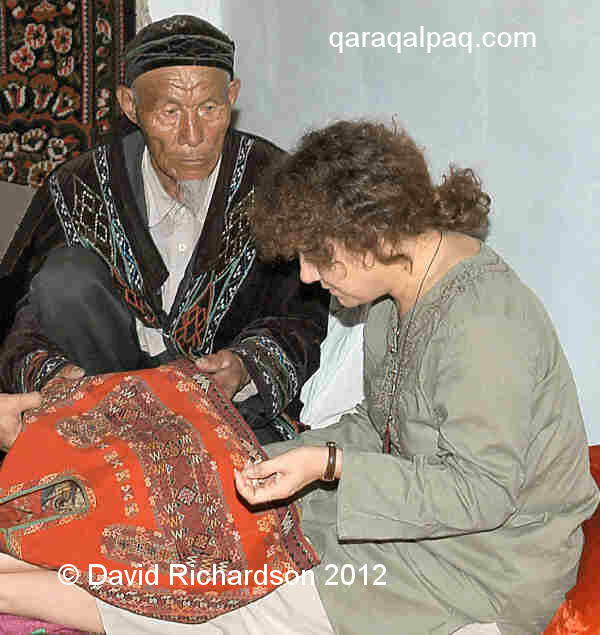 We have explored remote regions of the Qara Qum and Qizil Qum deserts, spending time and sharing meals with nomads in their yurts, whether Yomut camel breeders living close to the Sarykamysh Lake or nomadic Qazaq shepherds in the Aral steppes. We have watched Qaraqalpaq yurts being made, seen every stage of their erection and have lived and slept inside them. We have quizzed local weavers and embroiderers, shiy screen makers, carpenters, museum curators, ethnographers, historians, botanists and the directors and managers of collective farms. Wherever we have been we have made a special effort to seek out and talk to elderly people in the towns and rarely visited delta villages to record their earliest memories. 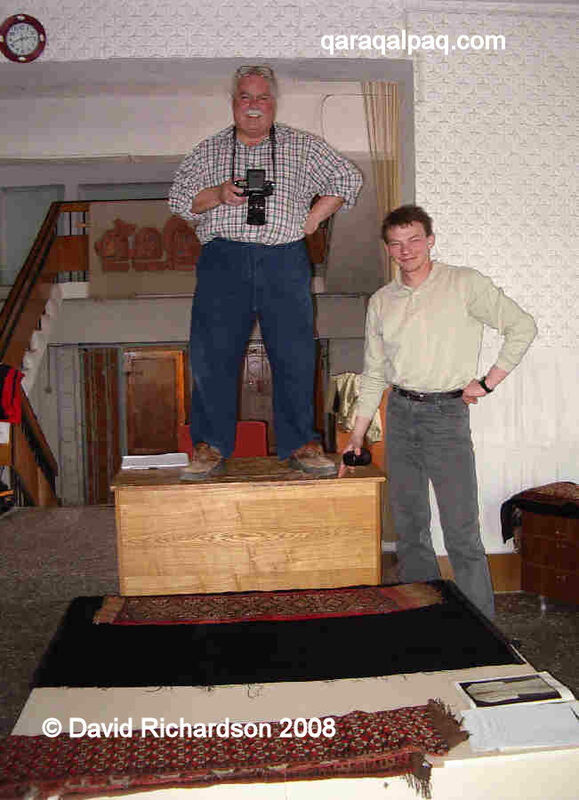 David and Maxim photographing esikqas in the fund at the State Museum of Art, No'kis, 2003. We have travelled to all of the museums outside of Qaraqalpaqstan which hold major Qaraqalpaq collections, especially those in Moscow and Saint Petersburg. We have extensively studied the large body of Russian references dealing with Khorezm and the Qaraqalpaqs, always trying to go back to the original and earliest sources of information wherever possible. Of course much of the early work on Qaraqalpaqstan was undertaken by Soviet-trained researchers with a Marxist mindset, operating within a fairly closed academic environment. We believe that we have looked at the history and culture of the Qaraqalpaqs with fresh eyes and open minds. Our article on Qaraqalpaq Carpet Weaving was published in the September/October 2005 issue of HALI (Number 142). Other articles have appeared in Asian Textiles and Hand/Eye magazine. We have lectured in the UK and will be undertaking a lecture tour in the USA in September 2012. 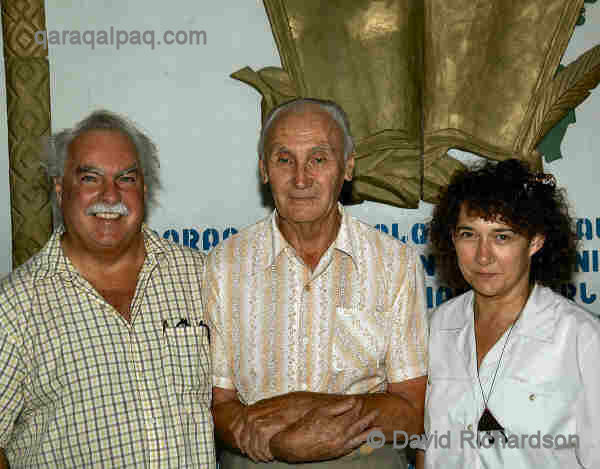 Our book Qaraqalpaqs of the Aral Delta will be published by Prestel in July 2012. 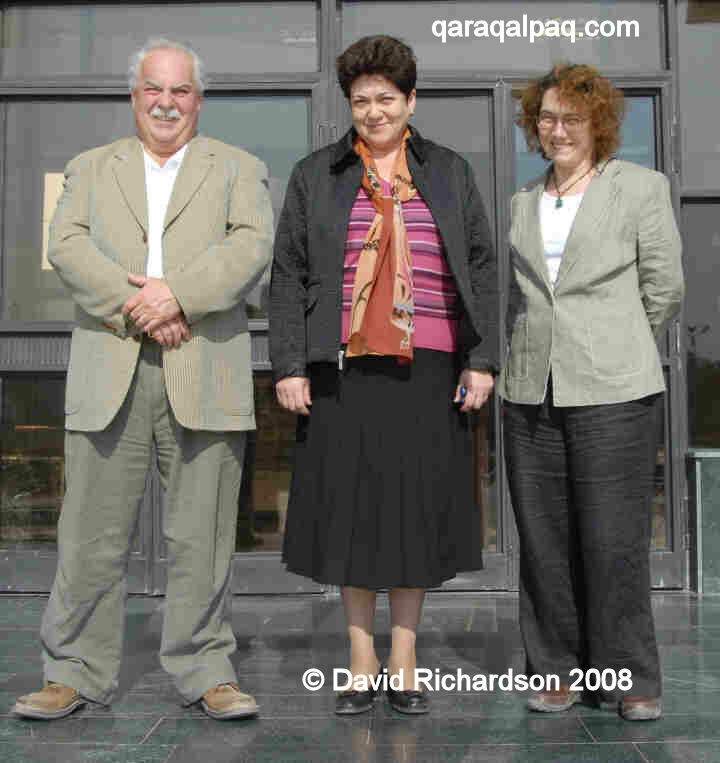 David and Sue with Marinika Babanazarova, Director of the Qaraqalpaq State Museum of Art, No'kis, 2007. 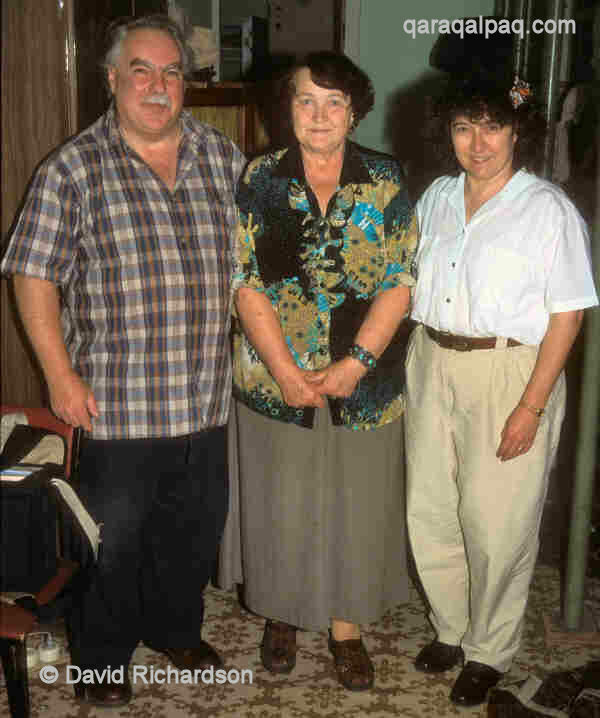 David and Sue with Svetlana Nurabullaeva, Director of the former Regional Studies Museum, No'kis, 2007. This website was launched in the autumn of 2005 and will continue to expand and be updated as we summarize the enormous volume of information that we have accumulated during our researches. We could not have undertaken this project without the valuable assistance of many people throughout Qaraqalpaqstan, as well as in Uzbekistan, Russia, the United Kingdom and elsewhere. We thank them all for their time and patience in answering our multitude of questions. Please contact us for any further information or to discuss all things Qaraqalpaq. This page was first published in October 2005. It was last updated on 30 January 2012.